Chalk up another eventful weekend training for the 2012 Bike MS: Pedal to the Point in northern Ohio. It’s a month away! If you’re able, please consider supporting my participation by making a donation to the MS Society. 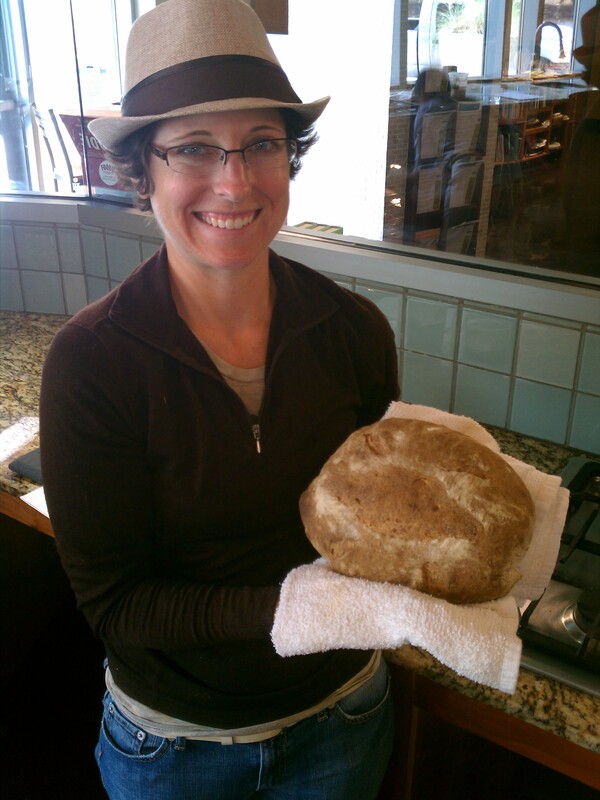 On Saturday, my husband and I attended a hands-on baking rye bread class at Whole Foods Market downtown. It started at 10 am so in order to get in a training ride, I headed out at 7 am. It was a great morning for a ride and after 32 miles I ended up downtown. This week I purchased a new helmet, my first super nice bike helmet. The airflow and weight difference were amazing. My supportive husband met me at Whole Foods with a change of clothes so that I could attend class in normal clothes rather than spandex. On Sunday we had some friends visit from out of town and we planned to meet them for a lunch date. 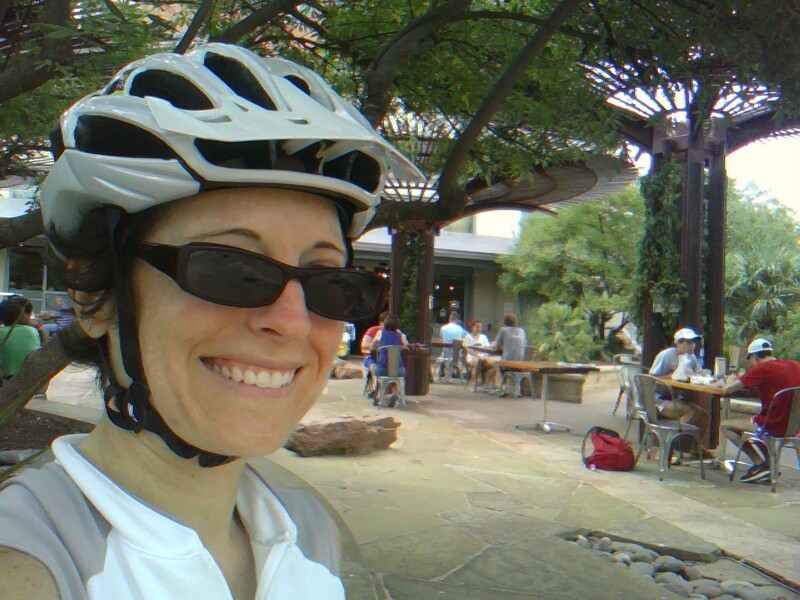 I wanted to leave early enough to ride 65 – 70 miles before we met for lunch at 12:30. Once again, I headed out at 7 am. I knew we were due to get some wind out of the south so I decided to ride a dam loop which puts the headwind early and a tailwind on the way home. I ride Parmer Lane, Anderson Mill, 620 (past Lake Travis), Bee Cave Rd, and Loop 360 for my dam loop. There was a chance of rain according to the forecast but no rain on the radar when I left. I didn’t get a picture of riding next to the dam itself due to speed and the attention necessary for a safe ride at that point, but you can see a nice ariel view of the dam and bridge on the LCRA website. After my first rest stop at mile 37 I realized that there was no way I was going to avoid being rained on. I could just see the cloudiness and rain to the east. Very soon after, I was drenched. The initial down pour was fairly heavy. The worst part was the rain drops in the eyes affecting my vision. I pulled over and sat under a bank drive through while the rain subsided. I was not the only cyclist I saw out in the rain. After that point it only rained lightly on me a few more times, but the road were wet everywhere. Luckily there was no thunder and not really any extra wind. Because the dam loop is quite hilly, I had to be extra cautious to make sure that I could stop if needed. Road bike brakes are pretty bad in wet conditions. I was able to make it through my training ride in time to dry and clean my dirty self for lunch, putting me at 68 miles Sunday for a grand total of 100 for the weekend and 150 for the week. Stay tuned for next week’s update where I travel to a new and exotic locale for some bike training. ← What to do with so many plants?